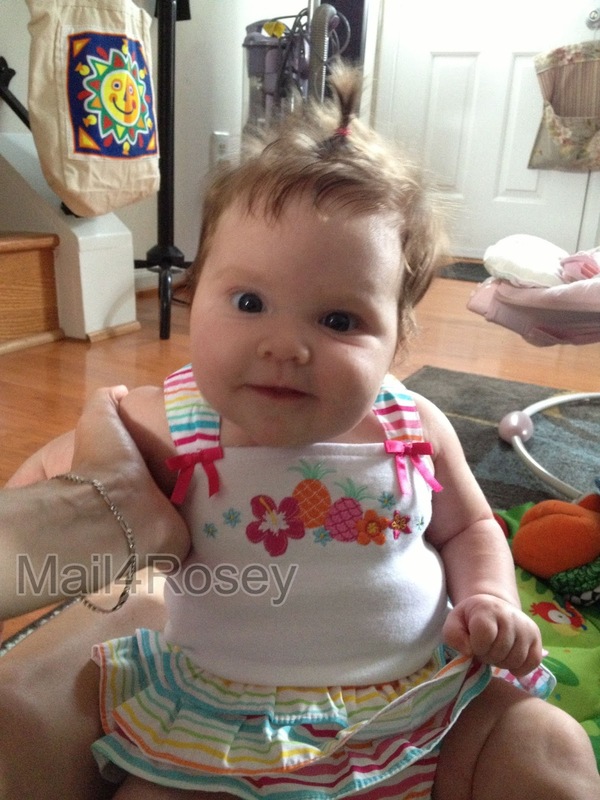 Mail4Rosey: #WW: Baby Girl Rockin' the Up-Do! She looks SOO much like her daddy did when he was her age (minus the little pony tail on top of her head ;) ). Little sweet, awesome, cute grandbaby. Grand-babies rock and then some. She's a cutie pie too, but you already know that. Aww! Rosey she is so cute heheh! Grandbabies are the best♥♥ Lovin the ponytail. Oh my goodness! I'd want to hug her tight. Such cute chubby cheeks. She's a cute little girl. She is getting so big! I guess they do that though lol. I am still thinking of her as newborn size! Your granddaughter is adorable and growing real fast Rosey! Lovely shot! I was so excited when I could finally eek a ponytail out on my baby's head! What a cutie! The cutest!!! I bet that you are the best granny ever. She makes me want one more! So sweet! Little girls are precious! Oooh Rosey. Smoochie her for me when you visit again. She is just adorable! Awww! What a darling! I wanna kiss those chubby cheeks! She's a little doll!! So cute! Is it sad when a baby has more hair than I do? Okay seriously, she is utterly adorable! Oh adorable sweetie! And the little ponytail is the perfect 'do! Oh my gosh! She is just as sweet as can be! Love the outfit and the ponytail! What a cutie ... LOVE all the hair! Rey had barely any hair for the longest time. How precious! We used to do that to my daughter! We called her volcano head. I absolutely love pudgy babies ! I just want to squeeze, cuddle, and smooch them all over! She's adorable! OMG. She is so cute. Love that picture. Oh, aww, she's soooo cuuute!!! Her little ponytail is adorable! I keep trying to put my Munchkin's hair up but it won't go yet:( Soon I hope! Oh my goodness how do you stand such cuteness!!!!! She is so so lovely, i love the up-do. And minus the dress, I would guess! Oh my she rocks that hairstyle - what a Cutie Pie. Isn't being a grandma the best? Awwww, her little up-do is so adorable! What a cutie! What a sweetie!! Isn't it great to be a grandma!! Ohhh this is to die for! I just want to cuddle her up! She is super cute!! I was missing her pictures! I think I just told you about that..LOL Thanks for sharing her beautiful smile! It sure brightens one's day!